The Amish Long Valley Dining Chairs seem as if they should be in the dining room of a country manor home in Europe. They have a grand, stately feel to them that fits with the furniture traditionally used in European manor homes and small castles. The Long Valley Dining Chair is a luxurious, elegant chair for discerning tastes. This hardwood chair is proudly Amish handcrafted in Lancaster County, Pennsylvania - proudly made in America. Exhibiting the French Country style, these solid wood dining chairs display a relaxed elegance in the dining room. The Amish Long Valley Dining Chair is steam bent and features a molded seat and tilt back. 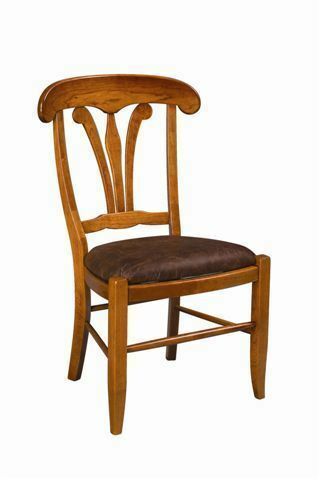 This European style chair is one of our most roomy chairs. The side chair has a generous seat that is 24" wide and 22 ½" deep. You can choose a wood seat, woven fiber seat, or upholstered seat with fabric or leather for your chair. Select side and arm chairs to complete your dining room furniture collection. The Long Valley Dining Chairs are the dining room chairs personally used in the dining room of DutchCrafters founders Jim & Linse Miller. Take a look at our helpful blog post, DutchCrafters Ultimate Guide to Choosing the Perfect Dining Room Chair, to see all the styles and features we offer. Call one of our helpful Furniture Specialists today at 866-272-6773 with questions.